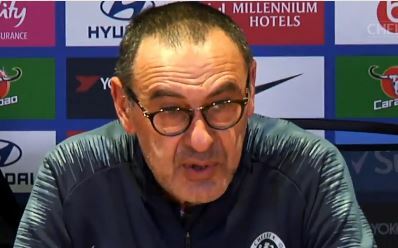 bChelsea take on Manchester City in the league today, and we finally get to find out what Maurizio Sarri’s preferred new team is. With Gonzalo Higuain in the side we lost to Bournemouth and then beat Huddersfield, with a slightly different team in each game. Now we see who he’s settled on as a preferred team. We know large parts of it. Kepa will play in goal, David Luiz and Antonio Rudiger will start too, unless the latter’s injury problem has struck back. The left of defence is a question mark. We lost heavily with Emerson in the team so we will probably see Marcos Alonso back in the side after he was present for the win last weekend. Then in the middle, N’Golo Kante and Jorginho are certain, with Mateo Kovacic possibly also getting the nod if Sarri looks to keep things tight. Up front, Eden Hazard and Gonzalo Higuain are certain, with Pedro probably most likely to get the nod to complete the team.